Human laws have not forgotten nature, but neither have they protected it. Nowhere is this failure more apparent than with ‘hydraulic fracturing’ for natural gas and oil, an extreme energy extraction method commonly known as ‘fracking.’ Along with tar sands mining and mountaintop removal, fracking is one of dirtiest forms of energy on the planet, releasing huge amounts of greenhouse gases into the atmosphere according to the US Environmental Protection Agency. Halting the destruction wrought by fracking requires new regulations and community controls over drilling, but it also involves something much deeper: the transformation of relationships between society and nature. Currently, human laws treat nature as mere property. In future, we must recognize that the ecosystems which sustain human life also have the right to exist, flourish and regenerate their natural cycles. Some 400 million years ago, ancient aquatic environments dried up, cementing fine sedimentary deposits over the millennia into hard shale, which now lie two miles or more below the surface of the earth. 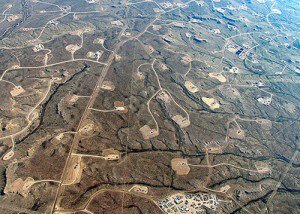 Today, through technology developed by Halliburton and other corporations, along with plenty of industry-friendly political will and legal heft, these ancient shale formations represent the new subterranean playgrounds of the oil and gas industry worldwide. * There are approximately 800,000 active oil and gas wells in the United States, hovering above some of the world’s largestshale formations. * Unlike most industrial activity which takes place far away from sight, fracking occurs less than 200 feet from homes and schools, on federal lands, in densely populated areas, and on farms and ranches. * It takes upwards of 400 tanker trucks to carry water and supplies to and from each well pad. * Each fracking operation uses between two and eight million gallons of water, and each well pad can be fracked up to eighteen times during its lifetime. Nationally, fracking uses over 100 trillion gallons of water and 400 billion gallons of “frack fluid” comprised of up to 600 different chemicals. * On average, 330 tons of these chemicals are used per fracking operation, and two-thirds of the most toxic chemicals remain underground. The millions of gallons of toxic waste water that are produced by fracking cannot be processed by wastewater treatment plants, so they are left in open pits. Thousands of these toxic stews were washed away during Superstorm Sandy and the recent extreme floods in Colorado. * Fracking causes earthquakes, which are now common in fracked areas of Ohio, a state not previously known for its seismic activity. * In theory, cement well casings protect the water supply by keeping toxins from leaching into aquifers underground. But research confirms that six per cent of these casings fail immediately, a figure that increases over time. Over one thousand cases of water contamination have been documented in frackland, and as the documentary film Gasland has made famous, methane leaks are commonplace, turning drinking faucets and showerheads into virtual flamethrowers. If fracking is so destructive, why are oil and gas companies allowed to override community concerns and site new wells directly in their midst? This question gets to the heart of the matter about the legal rights of nature and of people. In the USA, the Clean Air Act, the Clean Water Act, and similar laws at the state level effectively legalize environmental harm by regulating how much pollution can occur. Rather than preventing environmental destruction, these laws codify it, assuming that the best that can be done is to slow the rate of devastation. How else could we legalize the damming of rivers, the removal of whole mountaintops for coal mining, or fishing the oceans to extinction? We codify our values in the law, and Western societies have treated nature in law and culture as a “thing” to be dominated - amoral, without emotion or intelligence, and lacking any real connection to human beings. In this way we justify and rationalize our exploitation of the natural world. Nature is seen as a possession or as property, rather than as a system that governs our own wellbeing. These ecosystems have no legal standing in most courts of law. What do have legal standing are the energy corporations, which are in fact legal fictions on paper that can shield their CEO’s and their shareholders from liability for their decisions. By contrast, the communities in which the wells are located are denied the authority to say "no" to fracking, even as their health, safety and welfare are at risk each time a well is fracked. In many states fracking is unregulated, and in some areas it isn’t even monitored. Most communities aren’t notified that fracking is happening close by. Cloaked in constitutional protections, exemptions and well-greased political cover, the oil and gas industry stands on solid legal ground as it rolls into town. Some communities, however, are beginning to change the rules of the game. Nineteen communities in six states (Ohio, Pennsylvania, New York, Colorado, New Mexico and Maryland) have successfully banned fracking by writing new laws that place the rights of residents and their local ecosystems above the interests of corporations. They join the ranks of 160 communities across the USA who have already banned other harmful practices, along with Ecuador, Bolivia and (to some extent) New Zealand which have recognized the rights of ecosystems at the national level. Take, for example, the town of Mansfield in Ohio. In 2012 this community of 50,000 people was slated to receive toxic frackwater waste from Pennsylvania. Under state law there was little that they could do to stop it, since dumping unwanted fracking chemicals into “injection wells” in Ohio is legal. Nevertheless, concerned residents proposed an amendment to the town’s charter that affirms the rights of the local population to decide if injection wells are allowed within its boundaries. Suddenly, a matter of local concern became a major political issue for oil and gas companies and their Political Action Committees or PACS, which raise money on their behalf. Corporate contributors poured in over $300,000 to pay for TV advertisements and glossy brochures sent through the mail, which were designed to frighten residents into voting against the amendment on the grounds that it would be a “jobs killer”. The majority of Mansfield’s residents rejected this hype, reasoning that any jobs related to injection wells would not be as plentiful as promised, and that dumping toxic waste into the town’s industrial park seemed more likely to chase away new business than to attract it. As the town’s Mayor put it at the time, “We don’t like outsiders telling us what to do.” The amendment was passed with 63 per cent of the votes cast. Crucially, it subordinates corporations to the concerns of the community by stripping them of their legal “personhood” and other constitutional privileges, and recognizing the rights of natural ecosystems to be free from frackwater dumping. In 1973, Christopher Stone, a law professor at the University of Southern California, published a famous article called “Should Trees Have Standing?” In it, he explained why it is so hard to think about the rights-less as having rights. Citing the struggles of Abolitionists against slavery and of Suffragettes in favor of votes for women, Stone’s article showed how every emerging movement to recognize such rights has been deemed radical, and perhaps even treasonous. In the same vein, it may seem strange to argue that rivers and forests also have rights. But how different would it be in the world if the Amazon River could sue oil companies for damages, or if those responsible for oil spills could be forced to make the Gulf of Mexico “whole” once again, or if communities could be empowered to act as stewards for their local environments and ecosystems? The movement for the rights of nature has seen its ranks swell in recent times, as more and more communities realize that the law does not protect them from harm. The connections between our bodies and the web of life that sustains them are made more real with every industrial accident and incursion. As Mahatma Gandhi once said, “First they ignore you, then they laugh at you, then they fight you, and then you win.” When it comes to the rights of nature, nobody is laughing anymore.